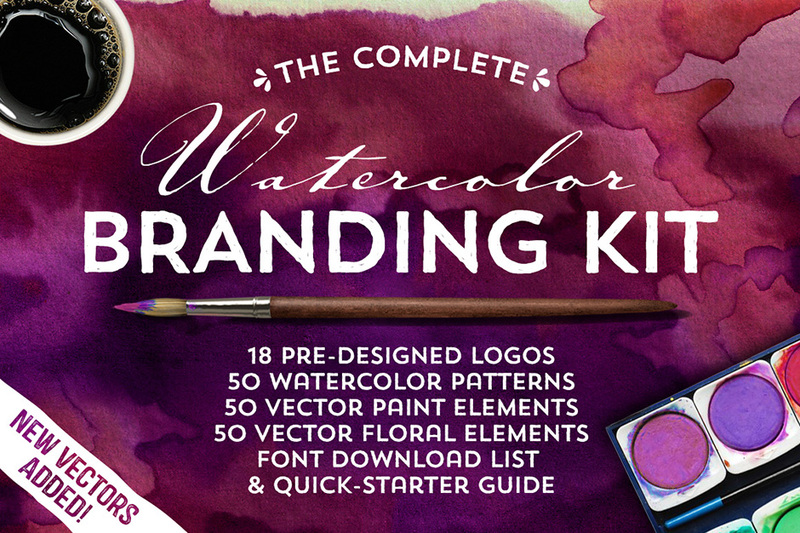 Introducing the Complete Watercolor Branding Kit! It has everything you need to design a totally awesome, vector watercolor logo. That’s right, each element was carefully drawn or painted, then scanned and vectorized, so that you have perfectly crisp graphics and total control over the size and shape of your logo. Go ahead and get crazy! Layer paint elements and splatters, or pair up floral elements for something completely unique! Download links to all the fonts I’ve used & Quick-Starter Instruction Guide. (Note: All fonts are free to download, but some are for personal use only, unless you grab a license. In this .PDF, I’ll take you through the basics of how to adjust the Photoshop logos & get that realistic edge effect too. Software compatibility: Adobe Photoshop and Illustrator CS or newer. .EPS files will work with a variety of programs such as Adobe Photoshop or Illustrator, Sketch, InkScape, Affinity, Corel Draw, etc. 100 Hand-Drawn Vector Floral Elements .AI, .EPS & .PSD. No Duplicates Counted. 10 Bonus Pastel Watercolor Backgrounds. Software compatibility: Photoshop CS or newer. File size is approx 464.5MB (389.1MB unzipped), offered as a single download. I would like to know if I can create a logo and put it on instagram, facebook, Etsy and eventually a website. I also want to make business cards. The logo would be simple to include a font and watercolor background. Would I have to download it on a USB flash drive and save it for future use? Also, would it be professional looking and not blurry? Thank you and I look forward to your response. Thank you so much for reaching out to us and we are so excited for you with your new ventures! Rest assured, I have popped you over an email to help!